Links to other websites can be easily added. From the main page of the Dashboard, click on the “Blogroll” tab. From this list, any of the current links can be edited or deleted. To add a new link, click the “Add Link” tab. 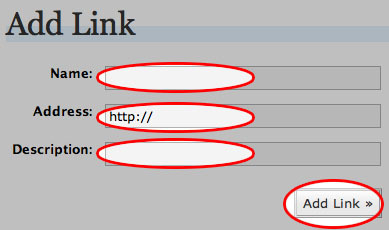 Give the link a name, then type or paste the URL in the “Address” field. Optionally, a description may be included. Click the “Add Link” button below to save these changes.